The event honoring Oliver takes a dark turn and an innocent man's life. 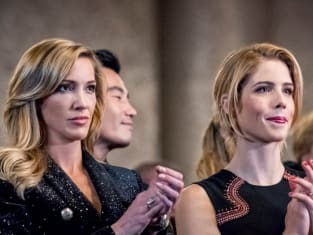 Arrow Season 7 Episode 8: "Unmasked"
Rene: Rich folk and politicians fronting like they actually care about prison reform. If everyone in here actually gave a crap, they'd use that money to help people in hard-up neighborhoods who end up in the system because they don't have anything else...What? Dinah: You ever think about running for office? Permalink: You ever think about running for office? 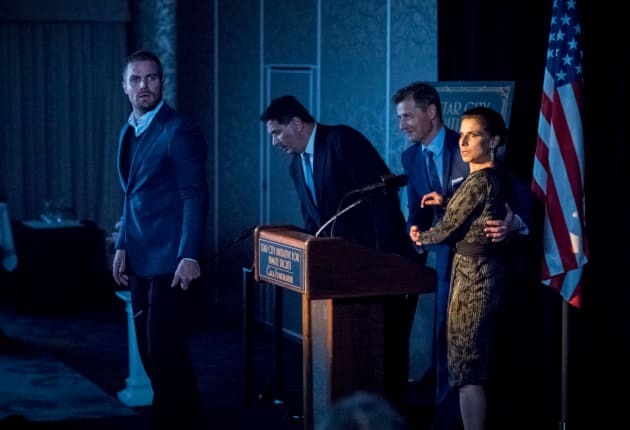 Oliver: You had your bodyguards kick the crap out of me and Tommy at your club. Max: Right, well you slept with my wife. Well, now my ex-wife. Dude, all of that is in the past, okay. Dude, you're the freaking Green Arrow. Felicity: Well I'm Felicity, I'm the wife of the freaking Green Arrow. It sounded a little less strange in my head.